Cardio Debate > Cardio Notes > Discovery > e-Cigarettes and cardiovascular disease: Are they as dangerous as the real thing? e-Cigarettes and cardiovascular disease: Are they as dangerous as the real thing? The relationship between smoking and heart disease is well documented, but there is a growing body of evidence suggesting that e-Cigarettes – formerly hailed as an effective and harmless tool in smoking cessation – also carry a significant risk of cardiovascular disease. e-Cigarettes are battery-operated devices that turn nicotine into a vapour that is inhaled. Although the exact composition of the vapour is unknown, it will contain substances like propylene glycol and glycerine, as well flavouring agents in the water and other potentially toxic by-products produced in the vapourisation process. To put it bluntly, it is not known what the ‘safe’ levels of toxins are in the vapour. Despite this uncertainty, since 2012 the number of adults using e-Cigarettes has increased from 700,000 to 2.8 million in 2016. And in a largely unregulated industry there is little evidence on the long term safety of using these products. 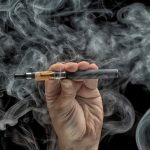 Interestingly, a recent study by researchers at the University of California, LA, and published in JAMA Cardiology suggests that habitual use of e-Cigarettes is associated with an increased risk of CVD. In particular, those who frequently used e-Cigarettes (defined as using daily for at least one year) were associated with increased oxidative stress and increased cardiac sympathetic activity compared to nonusers. However, he does concede that studies of this nature are bound to be small and cannot examine hard end points such as death and mortality because of obvious ethical reasons. He also states that despite the fact that e-Cigarettes do not taper the end nicotine addiction – such as established strategies like patches and chewing gums – there is still a place for their use in smoking cessation, albeit cautiously.